Located on the outskirts of Marmaris with a stunning mountain backdrop, the 3 star Club Exelsior is what family holidays are all about. From a fitness centre, Jacuzzi, swimming pools and waterslides, to an action packed kids club and a full programme of daytime and evening activities its easy to see why families return year after year to this lively complex. In the evening, dine onsite in the 250 seat restaurant and then join in the evenings fun or take a walk into Marmaris and sample the great selection of food and entertainment options on offer. Day or night, young or old, theres something for everyone at Club Exelsior. Club Exelsior offers guests a great choice of facilities. Youll discover three swimming pools including childrens pool, waterslides, Jacuzzi, sun terrace, childrens playground, kids club and disco/funpub. Theres also a 24hour reception, safety deposit boxes, money exchange, internet cafe, laundry service, doctor room, baby changing room, hairdresser, boutique, tattooist, fitness centre (Turkish bath, sauna and massage), jewellery shop, photo shop, gamesland ( video games, Playstation, pool tables, snooker, electronic darts, table tennis and football), two lifts, supermarket, big screen plasma TVs, bars and restaurant. 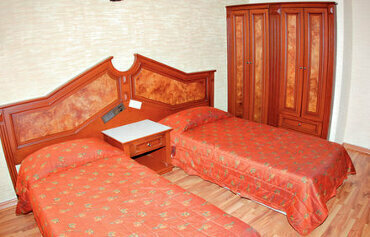 Club Exelsior boasts 93 apart rooms and 1 hotel room. The facilities in the apart rooms include: direct telephone, fridge, air conditioning, hairdryer, shower, kettle, satellite TV (payable locally), two ring cooker, microwave, toaster, balcony, bathroom and room service. The complex offers a 250 seater restaurant, pool bars and a disco/fun pub. 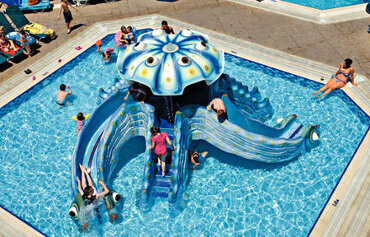 The daytime entertainment programme includes water polo, kids games, aqua gym, pool games, shuffle board and cash bingo. In the evening there's Karaoke, a Turkish BBQ night, cabaret, dancing and comedy shows, live music, quizzes, kids disco and show, happy hours, cocktail hours and competitions. 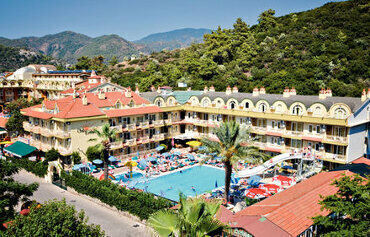 Club Exelsior is located 1km from the beach and Marmaris centre and 500m from bars and restaurants. I stayed here in the May school holidays and I was expecting very basic accommodation, but was pleasantly surprised as the pool areas were really nice and clean with plenty of sunbeds. The apartment was clean, tidy and a little basic, but we didn't spend much time in there anyway. The location was really good, just a ten-minute walk to the beach and marina and a five-minute walk to a good selection of family bars and restaurants. The apartments had entertainment throughout the day and night and the food in the accommodation is good too. I would definitely stay here again.